Cyrano does all the things Aramis can do – and a little bit more! The narrower beam angle makes it perfect for the really long throw distances found in the largest theatres and stadia while its glass progressive frost filter and dark blue dichroic filter give even more subtle design possibilities. The progressive frost filter, like the motorised dimmer shutter and the lamp on/off function, can be DMX-controlled for perfect synchronisation. 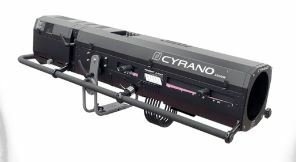 Its unique dimmer shutter gives Cyrano a superb dimming ability – surpassing even that of Aramis – making it indispensable for opera houses and large TV shows.